The Darkness Grows . . . The dark screams of the living touch not your bitter soul. You are torn between fealty to your elder masters and the surge of power within your young vibrant blood. The black dogs of the Sabbat are your sworn enemies . . . or they are your hidden leaders. You are Kindred. You are Childe of the Damned. There is great power in Undeath. The GURPS Vampire Companion takes over where GURPS Vampire left off. 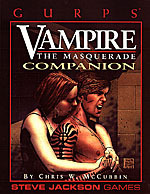 Within these pages, you will find new Disciplines, advanced Disciplines for older vampires, and all the new clans and bloodlines from the Vampire Player's Guide and the Player's Guide to the Sabbat, including an entire chapter on the diabolical Sabbat, their history, motivations and tactics. Also included are new rules for elder vampires, including the mysterious Inconnu, plus new GURPS advantages and disadvantages to help players enhance and customize their GURPS Vampire characters. And more . . . detailed rules for stalking and hunting, new conversion notes and four original adventure seeds to help spark unique GURPS Vampire campaigns. GURPS Blood Types – A look at the vampire in legend . . . and, yes, in history . . . through the centuries and around the world. GURPS Undead – Everything from subtle hauntings to undead necromancers, from Gothic vampires to the brain-eating zombies of the B-movies. GURPS Vampire: The Masquerade – A world where ancient vampire lords use their subtle machinations to control their unsuspecting minions . . . while within the bleak cities, Kindred princes flaunt their power, and the elders sway the prince.